If I would have told you months ago that Dynamite's "King Features" event would be one of the most enjoyable crossover events of the year and that Prince Valiant would be one of the best minis to emerge from it, you would have called me crazy. After all, the "Big Two" had their own events going on too so how could this small publisher compete? It doesn't have to compete because it relies on top talent to turn out light-hearted fun adventures like the big guys used to. Here we have a young Flash Gordon, Mandrake the Magician in the form of a dinosaur, a stoic Phantom, and a coming-of-age Prince Valiant. Does that sound like a formidable quartet of heroes to you? Well, Nate Cosby and Ben McCool bring so much humor and chemistry between the characters that they are instantly endearing and entertaining. This swashbuckling penultimate issue has our heroes on a rescue mission and along the way they fight off pirates, encounter magic and crack wise throughout. It's a quippy action adventure that keeps you glued to each panel. It doesn't hurt that Ron Salas is doing such gorgeous artwork with a cinematic sweeping layout that actuates the fighting and teamwork. Luigi Anderson's sun-washed colors brightly enliven this high sea adventure. 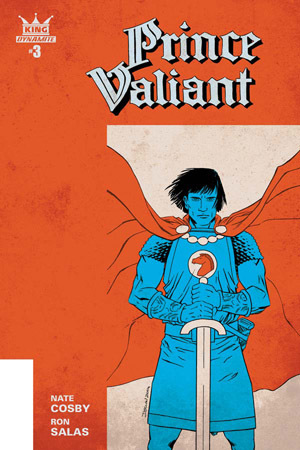 Prince Valiant has been a wonderful surprise. All the elements of great storytelling are here with an engaging protagonist, a high-stakes adventure, and beautiful art. Make yourself happy and get this series before it's over.